So, we've got a new long termer on the HJ fleet, and it's quirky. I have to admit, it's not a car that I've immediately taken a liking to. But that's okay, I felt the same about the Suzuki Ignis I ran for six months - and I loved that by the time it left. The Kona competes in one of the most competitive car segments in the UK, that of small crossovers. You know the ones. The likes of the Volkswagen T-Roc, Vauxhall Mokka X and Audi Q2 are all over British roads - offering good levels of standard equipment, practicality and affordable running costs. Hyundai is a bit late to the party. In comparison to models that have been kicking about for a few years, like the Nissan Juke, Hyundai has turned up to the party at 1am and found out most people have already left. But go big or go home, right? And that appears to be the thinking behind the Kona's very over-the-top styling. It's definitely bolder than other models in the range, but we quite like it. 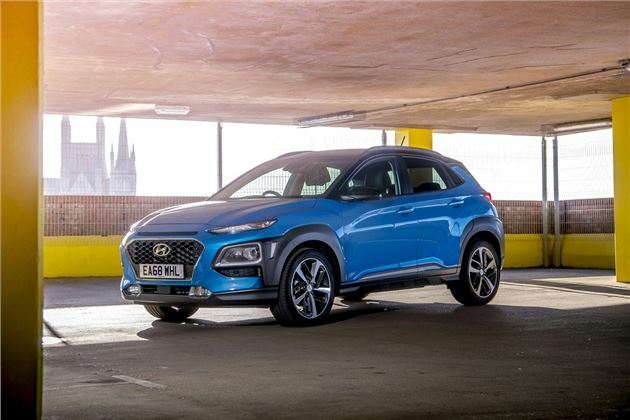 Like most Hyundai models, the Kona offers hassle-free motoring. And that's not to say it doesn't offer a decent driving experience - we'll talk more about that in a later update - it just means that it's not a luxury car. Nor does it aim to be. The swathe of drivers who prefer German cars wouldn't be caught dead in a Hyundai, Peugeot or Vauxhall, but motorists who are looking for a daily driver with no fuss and no frills will be happy to get from A to B in a model like this. The most positive point to mention shouldn't be the warranty, but its extensive five-year, unlimited mileage warranty is definitely a selling point. Prices start in the region of £16,000, and ours is about £10k more than that when you take the engine, gearbox, trim and extras into account. Equipment levels are decent too with basic models getting LED daytime running lights, DAB audio, touchscreen infotainment, a parking camera and cruise control. Inside the cabin it's a bleak sea of hard, black plastic (unless you opt for fancy colour accents). Conventional dials and an easy-to-use touchscreen infotainment system are simple to get to grips with, but are pretty uninspiring. Again, if you want something to impress your friends - you'd be better to save up for something else. We've got a 1.6-litre petrol Kona paired with an automatic gearbox. So far, I'm not loving the engine and gearbox combination. It needs to be pushed hard in low gears to get it moving, it makes a lot of noise and it doesn't overtake very well - but it's very early days. On first impressions, the Kona is a decent, different alternative to something like a SEAT Arona or Volkswagen T-Roc - but our engine/gearbox combo isn't ideal. Will time change our opinion? Georgia gets to grips with the Hyundai Kona and it's...unique...engine/gearbox configuration.